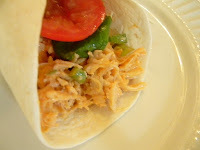 ﻿ Looking for a quick, easy Buffalo Chicken Salad Wrap recipe? I love Buffalo Chicken—whether it’s in wing form, sandwich form, or dip form. It is probably one of my favorite flavor combinations. I don’t, however, love the fat and calories hidden beneath the yummy hot Buffalo style sauce in the usual breaded, deep fried chicken. This Buffalo Chicken Wrap uses grilled or roasted chicken and low fat ingredients to give a healthier Buffalo Chicken with traditional Buffalo flavors. Prepare the Buffalo Chicken Salad Dressing. Combine the lowfat salad dressing, the Buffalo Wing Sauce, and the garlic powder into a small mixing bowl. Whisk thoroughly to combine. Combine the Buffalo Chicken Salad Ingredients. In a large mixing bowl, combine the chicken and celery—combine the two. Pour the salad dressing mixture over the chicken and celery and toss thoroughly to combine. Build the Wraps. Place ½-3/4 c. Buffalo Chicken Salad in the center of each tortilla wrap. Top with desired condiments, roll the wrap up burrito style and serve. Buffalo Chicken Salad Wraps go well with oven baked fries or baked potatoes.